Aptly named “Elysian Plain”, the resting place of the Greek Gods, this spacious five bedroom villa has a magical location and sits literally at the edge of the clear blue Caribbean Sea, with panoramic views stretching from east to west. To the front of the villa is a well-landscaped garden with lawns and flowering shrubs. 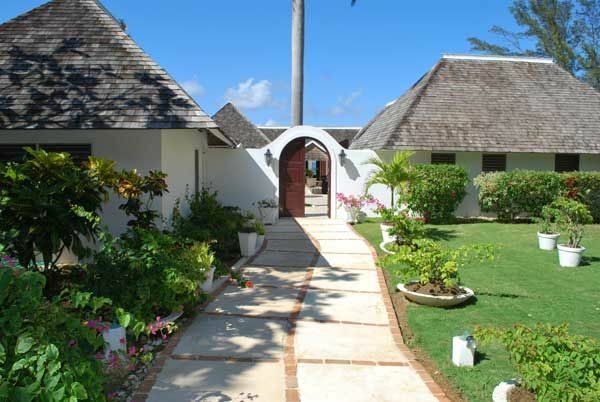 The villa features traditional Caribbean architecture and is built on one level with a detached cottage that houses two master bedrooms. The magical location and design optimizes views of the ocean and the seaside breezes. Two master bedrooms enjoy their own private cottage facing the shore. Each has a king sized four poster bed. The en suite bathrooms have been renovated in a contemporary style. Three guest rooms in the main house include one that has a king bed and is connected to a 4th bedroom which has three twin beds (two can be configured as a king), making this a great choice for families with children. The 5th bedroom offers twins beds which can be converted to a king. Each has a private en suite bathroom. All bedrooms open to the terrace and the wonderful views. There is an expansive wrap around pool deck, quiet seaside courtyard, beautiful lawns and a large swimming pool, all of which benefit from the gentle breezes off the ocean and the vibrant hues of the blue sea. Some 50 feet from the living room is a coral pool carved into the reefs which is always a huge hit with children and water lovers. The sea gently laps in and out making it a sensational place to sit and admire the view and listen to the sounds of the sea. A beautiful waterfall adjacent to the terrace dining area adds a charming touch to evening dinners. The spacious living room faces the ocean and is comfortably furnished in a relaxing style. You will be well cared for by an excellent cook, butler, housekeeper, laundress and gardener.